The EPLF Innovation Manifesto was officially adopted by members in May 2017. This strategy paper formulates the self-perception of the Association and defines the guiding principles for future activities. Not all laminate is the same! Why is European laminate the better laminate? Because in their role as worldwide leaders, European laminate producers have never stood still. 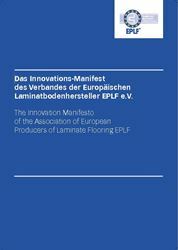 Although laminate has only existed for forty years, here in Europe we talk today about the sixth generation of laminate. The click system, embossed-in-register printing, integrated sound insulation, direct printing, 3D appearance, digital printing – these are all milestones in the development of a unique and fascinating floor covering. And all of these ground-breaking innovations originate from Europe. Every day, highly skilled staff at companies belonging to the Association of European Laminate Producers work on making the next generation just that bit better. Not only are they picking up new trends, they are also starting them. What drives the EPLF companies and their people? Firstly, their consistent focus on the benefit to their customers; after all, consumers want the best floor possible. They don’t think in terms of product categories, they look for flooring that suits their interior style and fulfils their requirements for high-quality and healthy living comfort. That is why European laminate is surpassing itself and keeps redefining itself as a new flooring category. Secondly, their passion and enthusiasm for their own products. Anyone who has witnessed the inventive spirit in this sector that exists not just in large corporations, but more often in small and medium-sized enterprises and small, specialized supply businesses, will understand that European laminate has more than just the obvious advantages – it also has a soul. The result is that every square metre of European laminate is a unique product. And, lastly, their absolute certainty that sustainable product quality, future-proofed design and innovative technologies will win through in the long term. Manufacturers and customers share the same responsibility for deciding on a floor covering that not only satisfies their own requirements but also fits the bill in terms of the environment and society as a whole. European laminate flooring is setting the benchmark in this area, which means it will never become outdated. This is why the members of the Association of European Laminate Producers are repeatedly reinventing their floors. In their manifesto, they define what it is that motivates them to do so. Innovation does not happen by chance. Behind it lies a clear strategy for each individual EPLF member company and for the Association as a whole. The EPLF offers a platform for exchanging information on innovations and embedding and safeguarding these in a sustainable manner as worldwide quality standards for this sector. The high level of involvement of each individual and the backing of the strong community within the organisation ensure that European laminate continues to develop. Success factors have evolved from this interaction, forming the mainstay of the enormous innovative capacity of European laminate. Within the confines of competition law, the EPLF operates as an expert network and a platform for information and dialogue. Overarching industry topics are worked on by committees and ad hoc groups and in seminars. The knowledge passed on by extraordinary members allows ordinary members to recognise new trends and technological developments (such as digital printing) at a very early stage, to evaluate them and incorporate them into their own product ranges. This gives members the opportunity to measure themselves against fair competition and increase their leading edge. The EPLF supports its members through the work of its Markets and Image Committee, by holding talks and specialist seminars and via consumer market research in core markets. Our members can benefit from this information to help increase their market penetration in existing markets and break into new markets both in terms of territory and subject areas. By holding advanced training on strong future regional markets, the EPLF aims to highlight and enhance future prospects for quality European products in different regions of the world. In addition, EPLF sales statistics serve to increase market transparency across the entire sector. And finally, the friendly interaction with other laminate associations promotes a better mutual understanding of the market. The rules for collaboration within the EPLF are laid down in competition law. The foundation work carried out by its Technical Committee and Markets & Image Committee serves as a basis for fair competition between members. At association level, they can take a common approach against distortion of competition in the regional markets, both within and outside Europe. This promotes fair competition for all market participants and that means better product solutions for the benefit of the consumer. The association is introducing a new Innovation Award to promote competition between EPLF players. Prizes will be awarded for innovative ideas from association members, which will give extra momentum to the development of European laminate. The EPLF offers members a marketplace for exchanging state-of-the-art knowledge. Technical information aimed at specialists and consumers is published in the main market languages, providing a practical foundation for companies to train their staff at the earliest opportunity. Potential future projects for the EPLF include: increasing e-communication via www.eplf.com, holding expert seminars and, in certain circumstances, awarding grants through the association. Professional communications between EPLF members centre around quality and innovation. The EPLF General Assembly is held at the premises of an ordinary or extraordinary member and acts as a point of contact for detailed discussions on innovations and trends within the European laminate industry. And now, after the group meeting format “LAMINATE 2020 - Forum of Innovations” was set up in 2016, this dialogue has been given a fixed framework. This is where suppliers in the EPLF give their major customers insight into their own thinking and design & development processes, giving European laminate producers first-hand creative impetus for implementation in their own product ranges. The development of standards and norms was a major motivation for the founding of the EPLF. The association initiates its own research projects of a pilot nature and works continuously on aligning EN and ISO standards to the state of the art as it moves forward. The EPLF is committed to product reliability and product transparency for the consumer and all market participants. The EPLF supports harmonised standards and is explicitly opposed to individual states within the EU going it alone, as well as non-harmonised regulations which hamper the free movement of goods and services. Its support of the EU Ecolabel demonstrates commitment to its environmental responsibility at EU level. ‘Quality and Innovation made in Europe’ – the EPLF logo is a label representing competence in quality and innovative spirit. It is communicated by members on packaging, product leaflets, advertising material, and at trade fairs on logo boards and roll-up banners. The market offensive led by the EPLF and its members is communicated in several languages via the www.eplf.com website and disseminated internationally by means of in-depth PR work in specialist media. Within the boundaries of competition law, the EPLF promotes topics for projects and communications with other partners. These include communication of the enforced standards. The EPLF is a meeting place for industry players to meet together on an equal footing. The structured work of the Association, which includes conventions, meetings, seminars and developing new meeting formats, reinforces the collaboration internally. The EPLF is available as a partner for discussion and cooperation relating to international industry trade fairs.